"I can’t thank you enough for all the help and assistance you are giving me. 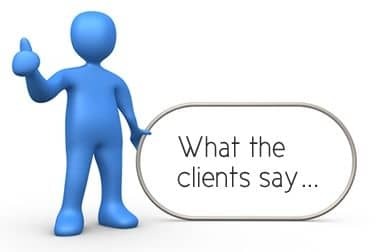 It’s been an absolute pleasure to deal with you and I can tell you I have been looking for a couple of months or so and my experience with some other agencies has not been that positive! I also really appreciate you keeping contact by email as it’s not always easy to have the phone calls while at work." "Congratulations on Rentolease's 20th anniversary next year. Although we didn't live very long at our flat in Wood Road, we always liked it very much and Rentolease have always looked after it very well with a minimum of fuss. There have been a variety of challenges from damp walls, storm damage, a non-paying tenant, equipment failure, having to register as a landlord in Ayrshire, but you have always provided good advice and helped us through these episodes in a professional but friendly way. We certainly appreciate all that Rentolease has done for us and wish you all the best for the next 20 years! We are very grateful to you for looking after the property. It seems amazing that we are one of your oldest landlords!" "I thought I'd drop you a line say thank you for the work you are doing for the estate. Each time I meet residents they remark on how great it is to see the estate looking so nice. What a difference from two years ago when my committee and I first suggested that engaging a factor was the best way forward for the estate. It is a testament to your tact and diplomacy that within a few months of you being engaged the original 12 holdouts was cut four and now we have one resident refusing to pay. The committee are most impressed with the way the work has been handled. After our AGM many residents took time to tell me how impressed that you took the time to attend. Thank you once again or your help and valuable assistance"
"With a number of flats for rent it was essential that we employed a professional and efficient organisation not only to find tenants but also to advise us on the various technicalities to ensure that we complied with the regulations concerning letting which are becoming more and more complex and onerous. In Rentolease we have found that partner. If you add to that their ability to find the most suitable tenants and to ensure that rents are collected in good time we are more than fully satisfied with the attention we receive." We were very fortunate to know Rentolease. My friend recommended me Rentolease a few years ago, she also has been with Rentolease for many years. We live abroad and Rentolease makes us feel relax with regards to our property being rented. Rentolease is a professional agency and i will have no doubt to recommend to anyone. I was recommended to approach Rentolease to look after my properties a number of years ago and have enjoyed a helpful, friendly and professional relationship with the Team ever since, benefiting both myself and my tenants. Well done and thanks to everyone at Rentolease. I have been a client (Landlord) with Rentolease since 2006. Before moving to Ayrshire I had several properties in Glasgow and have dealt with Agents there and Rentolease is excellent to deal with. The staff at Troon and Prestwick do a great job and they are helpful, friendly and reliable, I couldn’t ask for better. Due to a job change and relocation overseas, it became apparent to me that I would have to do what I thought would be a difficult, incommodius and worrisome task... become a "landlord". All I can say is thank goodness for RentoLease. All I had to do was read, understand and sign a couple of documents. Firstly, they ensured that my house complied with all the current health and safety requirements (not just protecting themselves or me, but the tenants too); then they provided me with a fair valuation for the rental income I could expect and above all, very quickly secured great tenants and ensured that any monies due to me were paid in a timely fashion. An additional "service", that Rentolease don't really advertise, is that they will complete all the "little jobs" around the house that you had planned to do, but never got round to. They attained very competitive rates from reliable local tradesfolk and now my house is in better condition than it ever was when I lived in it... thank you. If you're looking for a hassle free, well managed way of renting or leasing out your house, Rentolease is the way to go.